The Julia Child Foundation for Gastronomy and the Culinary Arts was created by Julia in 1995 and became operational in 2004. Headquartered in Santa Barbara, California, the Foundation is a non-profit which makes grants to support research in culinary history, scholarships for professional culinary training and internships in food writing, as well as professional development and food literacy programs. Over the last decade, the Foundation has made more than $2 million in grants to other non-profits. In 2015, the Foundation created the Julia Child Award, presented in association with the Smithsonian’s National Museum of American History. The annual Award honors an individual who has made a profound and significant difference in the way Americans cook, eat and drink, and is accompanied by a $50,000 grant from the Foundation to a food-related non-profit selected by the recipient. The Foundation identifies and selects its grant recipients; however, we are open to learning about new opportunities. Click here to inform us about your project or organization. (Please note that the Foundation can only support organizations designated as non-profit by the Internal Revenue Service; we do not make grants to individuals.) The following is a representative but not comprehensive list of current and past grantees. Alaska’s leading art, culture, history and science museum for residents and visitors alike, the Anchorage Museum opened its doors in 1968, and welcomes more than 200,000 annual visitors. With a particular focus on the North, the museum curates and produces its own exhibitions as well as welcoming national touring exhibitions. The Foundation supported Whale & Cupcakes: Food Culture in Alaska, an exhibition and series of public programs examining the area’s unique food culture, along with an accompanying cookbook and essay collection. Julia was instrumental in the formation of and highly supportive of BU’s groundbreaking Master of Liberal Arts (MLA) in Gastronomy. The interdisciplinary program teaches students to view food through different lenses – from disciplines as diverse as anthropology, history, public policy and business – and features experiential learning through culinary arts laboratories and wine studies. BU’s full-time Culinary Arts program, co-founded by Julia and Jacques Pépin in 1989, features intensive, hands-on cooking and baking courses taught by experienced working chefs and food industry experts. Merging traditional culinary arts study with hands-on instruction in a laboratory kitchen, the program provides deep insight into the food industry and prepares students for a wide variety of jobs. The Foundation supports merit awards presented to students in BU’s Gastronomy Program, as well as Teaching Assistant positions awarded to outstanding students in the Culinary Arts Program. Julia encouraged young people interested in cooking professionally to get solid training and gain work experience in good kitchens. C-CAP is a multifaceted school-to-career program that prepares underserved high school students for college and career opportunities in the restaurant and hospitality industry, including internships and employment in top restaurants and corporate dining facilities. The Foundation helps support C-CAP’s Summer Job Training Program, which provides high school students with work skills and on-the-job experience. The students gain valuable experience to prepare them for entry-level jobs in restaurants, hotels, schools, hospitals and other major foodservice venues. Furthermore, the program equips young people with job skills that are applicable to all professions, such as communication, time management, interpersonal relations, problem solving and work ethics. Founded in 2003 in Chicago, Common Threads was created to bring health and wellness to children, families and communities through cooking and nutrition education. By integrating preventative health programs into school districts and community organizations, Common Threads not only helps combat the rising number of diet-related diseases, but also cultivates a culture that embraces a healthier lifestyle and celebrates diversity through food. The organization envisions a community of learners that embraces healthy cooking, eating and living as both a life choice and a human right. The Foundation supports Common Threads’ cooking and nutrition education in Los Angeles county schools and community organizations. Julia was a committed student and passionate about enhancing her knowledge of the culinary arts, including its history. Culinary Historians of New York (CHNY) was founded in 1985 to support research, share knowledge of how food has affected individuals since earliest times, and raise awareness about the field of culinary history. Members of CHNY include chefs, cooking teachers, historians, anthropologists, food writers, food editors, food stylists, researchers, librarians, caterers, collectors, nutritionists, and food enthusiasts – intellectual curiosity is the common denominator. The Foundation supports The Culinary Historians of New York Scholars’ Grants, which are designed to promote research and scholarship in the field of culinary history. A strong believer in culinary education, Julia frequently recommended this prestigious college to aspiring professionals. She addressed several graduations, conducted cooking demonstrations, and engaged students in question-and-answer forums. Julia was named a Fellow of the college and was the first woman inducted into its Hall of Fame; she was awarded the CIA’s Honorary Doctorate of Fine Arts degree and its first Lifetime Achievement Award. The Foundation supports scholarships in culinary writing, food media, and culinary education for students planning to pursue careers in food media/journalism and in teaching the culinary arts respectively. In 1984, Julia became one of the first Trustees of the Cooking Advancement Research and Education Foundation (CAREF), formed under the auspices of the International Association of Culinary Professionals as its philanthropic arm. Later renamed The Culinary Trust, the organization solicits, manages, and distributes funds for educational and charitable programs related to the culinary industry, including scholarships for students and career professionals, library research, travel grants for food writers, cookbook preservation and restoration, and the alleviation of hunger. The Foundation supports a professional development grant that accompanies the IACP Julia Child First Book Award and is administered by The Culinary Trust. Julia was committed to making the culinary arts and gastronomy accessible to a wide audience. Heritage Radio Network.org (HRN) is a member-supported, web-based radio station focused on creating a more equitable, sustainable and delicious world by expanding the way eaters think about food. Comprised of more than 35 weekly shows broadcasting around the world, HRN is a 501(c)(3) non-profit now celebrating its 10th anniversary. Operating out of two converted shipping containers in Bushwick, Brooklyn, HRN welcomes the best and brightest thought leaders in the food world as guests, and regularly hosts events and panels on a variety of culinary topics. Their archive holds more than 12,000 episodes available to stream or download free of charge. The Foundation supports programs and initiatives to help HRN expand its overall programming capability and in turn its audience reach. Julia visited Johnson & Wales University several times during her lifetime and was awarded a Doctor of Culinary Arts from the university. Today, nearly 7,000 students are enrolled in two or four-year Culinary Arts degree programs across its four campuses (Providence, RI, Denver, CO, Charlotte, NC, and North Miami, FL). The majors in this program include Baking & Pastry Arts, Culinary Arts, Culinary Nutrition, Culinary Arts and Food Service Management, Baking & Pastry Arts and Food Service Management, and Food Service Entrepreneurship. The Foundation provides scholarships to support students pursuing their A.S. and/or B.S. degrees in JWU’s Baking and Pastry Arts programs across the different campuses. LDEI is a worldwide philanthropic society of professional women leaders in the fields of food, fine beverages, and hospitality, and composed of 42 individual chapters across the United States, Canada, the United Kingdom, Mexico, and France. During her lifetime, Julia received the honorary title of Grande Dame, given in recognition of extraordinary and unusual contributions to the fields of food, wine, other fine beverages, nutrition, and the arts of the table. The Foundation supports LDEI’s Legacy Awards in which veteran members mentor other women in the food, fine beverage and hospitality industries. New York City College of Technology, Department of Hospitality Management is part of the City University of New York. The school offers students Bachelor of Technology and Associate in Applied Science degrees in the areas of Culinary and Pastry Arts, Food and Beverage Management, Hotels and Resorts, and Tourism and Travel Management, along with a Culinary Arts Teacher Education Degree to teach in New York City high schools. Well-known New York chefs and sommeliers serve as Adjunct Professors in the Hospitality Program and students take part in internships in esteemed New York City hotels and restaurants, often leading to full-time positions. From the kitchen to front-of-house, hospitality students participate in running a full-service dining room, which is also used for events. The Foundation supports an innovative wine blending program curriculum which enables students to study advanced wine topics and work with a local Brooklyn, NY wine producer on various stages of the vinification process. Participating students then share their knowledge by teaching their peers in the Dining Room Operations course about the wine making process they engaged in. Founded in 1992, Oxford American magazine is published by its parent company, the Oxford American Literary Project, a non-profit arts organization based in Little Rock, Arkansas. Committed to telling the complex, vital story of the American South, Oxford American publishes fiction, nonfiction and poetry in four annual issues, and has received multiple National Magazine Awards, including the 2016 National Magazine Award in General Excellence. The Foundation supports a series of online documentary videos to accompany John T. Edge’s Local Fare column, as well as a six-part web series written by Osayi Endolyn. Julia attended the Oxford Symposium on Food & Cookery – an annual, weekend-long conference on food, its culture and its history held at St. Catherine’s College, Oxford, England. Since 1981, the Symposium brings together an interdisciplinary mix of international scholars, food writers, journalists, chefs, scientists, sociologists, anthropologists and amateurs for serious and spirited discussions about the theme at hand. Symposium themes include: “Food and Material Culture,” “Wrapped and Stuffed Foods,” the “Seeds” and “Food and Cookery: The Impact of Science in the Kitchen.” The Foundation supports a scholarship program that helps students attend the symposium, which in turn helps further the Oxford Symposium’s strategic focus on engaging the next generation of food scholars. In November 2001, when Julia left her Massachusetts home of 42 years to return to her native California, she donated her kitchen to the Smithsonian National Museum of American History (NMAH). The kitchen was deconstructed, transported, and reconstructed in the Museum to become “Bon Appetit! Julia Child’s Kitchen” at the Smithsonian, which opened in 2002, and has been one of the museum’s most popular exhibits. In conjunction with Julia’s centenary in 2012, NMAH opened a new exhibit: FOOD: Transforming the American Table 1950-2000, which included the re-installation of a new and improved Julia’s Kitchen as its entrance. The Foundation continues to support the ongoing conservation of the exhibit and its contents, as well as supporting educational programs at NMAH, which focus on culinary history and education, such as the American Food History Project, its “Kitchen Cabinet” steering committee and its recent Food in the Garden summer series. Julia was a passionate advocate for sharing the joys of cooking and the pleasures of the table with family and friends. Spoons Across America is dedicated to educating children, teachers and families about the benefits of healthy eating. Through a series of hands-on cooking and nutrition programs tailored to different grade levels, Spoons Across America aims to give New York City children a healthy start in life, as well as the tools required for a lifetime of healthy, delicious eating. Over the years, the Foundation has supported numerous Spoons initiatives, including The Dinner Party Project, an eight-week, family-focused educational program for 5th graders that includes seasonal meal planning, nutrition, food safety, table setting, etiquette and cooking, all culminating in a dinner party to which students invite their families. The Foundation has also supported Take-a-Taste with Spoons, an exploration-based program for 3rd graders, and Farm to Book, a food and literacy program for 2nd graders. The Department of History at the University of North Texas hosts one of the largest and best collections of food history scholars in North America, with nearly a third of its 26 tenure-line faculty members teaching and conducting research on the historical dimensions of food. Beginning in the fall of 2018, UNT launched a unique food history Ph.D. concentration to meet the growing student demand for graduate level training in food studies and thus establishing the only major center for food studies research in the South/Southwest region and one of only a few in the United States and around the world. The Foundation supports a two-year fellowship for a graduate student who will earn a Ph.D. with a concentration in food history, providing access to high-quality education in the field of food studies, while also fostering the study of food history at large. A passionate academic, Julia was committed to enhancing her knowledge of the culinary arts, including its history. The Culinary Historians of Chicago (CHC) is an educational organization committed to the study of the history of food and drink in human cultures. CHC’s members are from a wide range of competencies – the common denominator being that all are food enthusiasts. The Foundation supported The Culinary Historians of Chicago Scholars’ Grants (in collaboration with the Greater Midwest Foodways Alliance) to encourage the study of Midwestern foods and food-related institutions. The awards are intended to help underwrite the research of academics and other investigators who intend to publish their findings in books, articles, videos or other media. Julia appreciated the academic side of the culinary arts, including its history. The Culinary Historians of Southern California (CHSC) was founded in 1995 as an affiliate of the Los Angeles Public Library. Its membership of 250 comprises culinary professionals, academics and interested amateurs from various fields. The group presents monthly forums at the Los Angeles Public Library and CHSC members contribute to the library’s culinary collection that includes over 18,000 cookbooks. CHSC curates talks at libraries and cultural institutions and they periodically run events investigating the culinary culture of different ethnic and historical neighborhoods in greater Los Angeles. The Foundation sponsored a lecture series on food history in libraries and museums throughout the greater Los Angeles area. Seattle’s Museum of History and Industry (MOHAI) was founded in 1911 and is dedicated to engaging visitors in the exploration and understanding of the history, character and development of the Puget Sound. Now housed in the landmark Naval Reserve Armory in Lake Union Park, MOHAI welcomes 150,000 annual visitors, including more than 35,000 K-12 students. The Foundation supported MOHAI’s Edible City: A Delicious Journey, a 5,000 square foot exhibition dedicated to the history of Seattle’s urban palate, and featuring the Museum’s award-winning interactive approach to exhibit curation. An avid collector of books and a travel enthusiast, Julia enjoyed visiting and learning about various cultures. The National Food and Beverage Foundation documents and celebrates the food and drink of all cultures through exhibits, programming and a range of media. The National Food and Beverage Foundation comprises several divisions, such as the Southern Food and Beverage Museum, the Museum of the American Cocktail, the Culinaria Center for Food Law, Policy and Culture and the John & Bonnie Boyd Hospitality & Culinary Library. The Foundation supported the research and development of an exhibit on food and cultural identity entitled, “A Defining Taste: Cuisine, Cultural Identity and the Creole Migration.” The exhibit illustrates the great post-war Creole migration from New Orleans and other parts of Louisiana to the West Coast and other points along the nation’s railroad lines where Creoles employed cuisine as a means to re-establish themselves in a strange place. The John & Bonnie Boyd Hospitality & Culinary Library contains over 11,000 volumes of culinary books, food and cocktail menus, pamphlets, archival documents and a growing number of important collections. The Foundation also gave a grant to support the acquisition and conservation of new and rare cookbooks at the library. Julia felt strongly about the culinary arts being accessible to students, professionals and virtually anyone enthusiastic about food. The Food Studies program at The New School for Public Engagement provides students with the theoretical and practical tools they need to engage in conversations about food culture, production, distribution, quality, safety, and security and to promote positive change in food systems through participation in administrative and political projects, interventions through media and communication, and design. The program offers full-term undergraduate and continuing education courses in culinary history, food policy, the food business, food and health, food media, and food and culture. The school also offers short courses and one-day workshops for working and aspiring food professionals. The Foundation supported the launch of a Massive Open Online Course (MOOC) on the history of the culinary arts in the U.S entitled “Innovators of American Cuisine.” Reaching a large and diverse domestic and international audience, The MOOC is structured around videos of panel discussions that take place among experts in their field, well-known authors and culinary professionals. Julia was passionate about writing and felt strongly about opening doors for other food writers to advance in the field. In an effort to increase the number of opportunities for aspiring food writers to get on the job experience in the professional food writing world, the Foundation launched The Julia Child Foundation Food Writing Fellowships in partnership with NYU’s Food Studies Program. The program, available exclusively to NYU students, provided students with paid internships in editorial departments at both traditional print publications and cutting-edge food related websites. Students received substantive opportunities and participated in a diverse range of activities from story research and fact checking to editorial meetings with senior staff. The Julia Child Foundation Food Writing Fellows have completed fellowships at the following publications: Food & Wine, Edible New York and Edible Manhattan, Epicurious, Food52, The Daily Meal, Heritage Radio Network, Serious Eats, Lucky Peach, Food Arts, Roads & Kingdoms and Wine Enthusiast. Julia greatly valued and admired the Schlesinger Library and all it does to collect and preserve materials relating to the culinary arts. Originally developed because cookery has been such a significant part of so many women’s lives, the Library’s renowned culinary collection of more than 15,000 books and numerous periodicals, pamphlets, and manuscripts now spans four centuries and includes rare and classic titles from around the globe. The Foundation has supported the Schlesinger’s Culinary Collection and the preservation of and public access to the personal papers Julia Child donated, as well as the cataloging of Julia’s books and memorabilia and the cataloging and digitizing of Paul Child’s photos, which include pictures taken from the Childs’ years in France and during the filming of The French Chef. The Foundation also made a grant to the Schlesinger Library to conduct a women’s oral history project about the life and work of Judith Jones, Julia’s longtime editor at The Knopf Doubleday Publishing Group. Julia enjoyed traveling and learning about the food histories and customs of various places, both domestic and international. The University of Arkansas Press’s “Food and Foodways” series, edited by Professor Jennifer Jensen Wallach, uses food as a lens to examine broader social, political, cultural, and economic issues. The Press is committed to covering lesser-known food histories and to publishing stories about foodways that are as diverse as possible. They seek to document the food practices of people in far-flung geographies who hold a variety of beliefs and represent the entire social spectrum. Titles include general trade books, university classroom books, scholarly monographs, and books covering many disciplines. The Foundation provided a grant to support the publication of several titles in the inaugural “Food and Foodways” series. Julia had a keen taste for street food and was known to crave a good hot dog every now and then. Among other foods, Chicago is certainly known for its Chicago-style hot dogs. Located at the center of America’s agriculture heartland and bordering the nation’s great waterways, Chicago is known as one of the world’s great and, until the last decade or so, greatly underrated food cities. As the commodity shipping and production center of the United States, Chicago stands at the heart of America’s food industry and boasts an enormous diversity of ethnic neighborhoods and cuisines. In 2016, The University of Illinois Press published The Encyclopedia of Chicago Food and Food Cultures, a trade paperback exploring how food and beverages have shaped Chicago’s rich gastronomical scene and cataloging its extensive culinary history. The Foundation gave a grant to The University of Illinois Press to support contributions from writers, scientists, researchers and chefs to the project. Julia had great affection and respect for public television and, in particular, WGBH, where The French Chef series debuted nationally in 1963 and ran for 10 years. 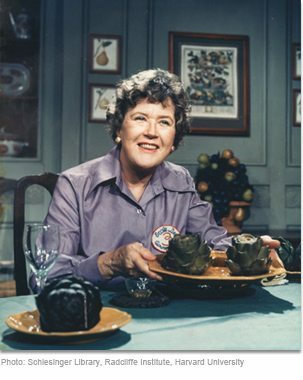 Subsequent WGBH cooking shows – which included Julia Child & Company, Julia Child & More Company and Dinner at Julia’s – have been aired and repeated ever since. WGBH continues to develop and support fine gastronomy and culinary arts programming. The Foundation recognizes the long-standing relationship between Julia and WGBH and its high-quality culinary programming. The Foundation most recently supported a project to digitize and preserve rediscovered footage primarily from The French Chef.